Built around 150 years ago, La Casita is one of the oldest cottages in the French Quarter of La Palma. 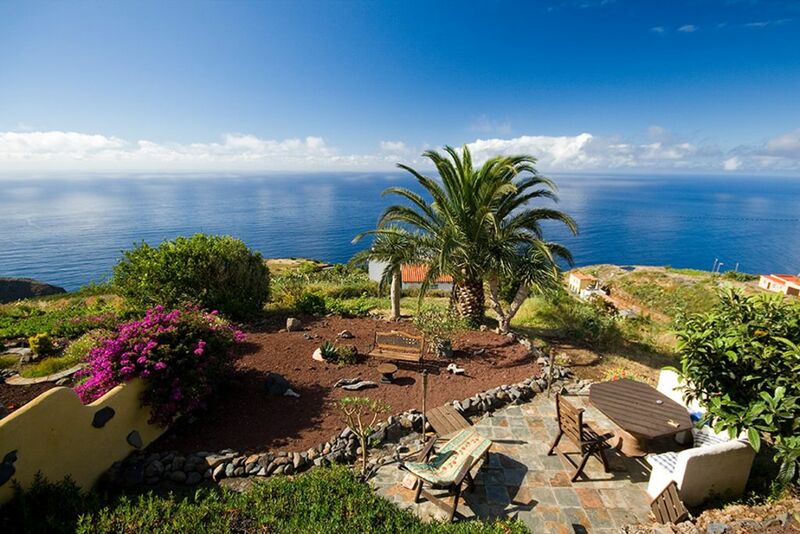 If you are looking for a rural cottage on La Palma, Canary Islands offering peace and tranquility but by the beach and with a small town nearby - that little piece of magic - then here you will find something simply special. With a view over the whole of the north coast of La Palma and a backdrop of lush green mountains to the rear, la Casita truly is a home from home in a stunning location. Comprising fully equipped kitchen, lounge/dining area, large and romantic bedroom with wooded ceiling and bathroom en-suite with Victorian-style cast iron bath (a bath for two!). There are two terraces/patios at the front of the house with various seating including loungers and deck chairs so you can soak up the sun or sit and read in the shade. There is also bench seating around a table so that you can enjoy meals outside, all with a panoramic view. It is said that La Palma is one of the last places in Europe with a wonderful climate and little tourism. It is true that here, you can slip back in time and rediscover simplicity and beauty. The tranquil atmosphere of your traditional cottage will allow you to relax, enjoy the pure air and admire the incredible sea view. La Casita was the original cottage built on the land of Finca Franceses. Later, a traditional farmhouse was built alongside it. Thus, La Casita, is now attached to the farmhouse. The finca nestles in the fantastic scenery typical of the North Both La Casita and the farmhouse were built in the traditional style of the time with resources available nearby such as stone and pine. They are now completely restored, whilst retaining original and very special Canarian features. La Casita has a wonderfully rich feeling of the past and yet happily benefits from selected modern conveniences. La Palma is walking country - historically because of necessity and latterly because walkers appreciate its stunning and vastly contrasting landscapes. From the highest point of 2426m at Roque de Muchachos, swooping down to azure blue seas you will encounter pine forests, lava fields, banana plantations, almond groves and much, much more. Discover hidden settlements of the north like Franceses, linked by ancient donkey tracks. There is also a separate bodega (stone-built dwelling, traditionally a wine cellar) close to the casita. Guests are welcome to enjoy this special place which is cozy and enchanting and will enthrall you with its magical and calming atmosphere. Enjoy a romantic dinner by candlelight, or perhaps a game of cards, together with a glass of local red wine to make an evening to remember. One rainy day in January 2002, David and I left York, North Yorkshire for the Canary Islands in search of 'somewhere special.' With a one-way flight ticket from Manchester to Tenerife, we had sold our home, put our furniture into storage and set off clutching our suitcases and aspirations. Little did we know that it would take 6 months of searching! Needless to say, it was a somewhat longer adventure than we had planned ... ... as a result of which we travelled to each and every one of the Canary Islands in our quest. But we met many lovely people along the way and learnt a lot about the Islands and renting houses and apartments. On La Palma we stayed in both the east and the west for six weeks at a time, but still couldn't find exactly what we were looking for. In our spare time we walked many routes on the island and we also joined a local walking group who took us on great adventures such as the natural springs of los Tilos, the GR130 and GR131. However, although it was an interesting learning curve, we did start to wonder just when we could unpack our suitcases for the last time. And then someone mentioned a house in the north for sale. 'Not the north!' we cried. Whilst the north had long held a place in our hearts as being the most beautiful part of the island with incredibly dramatic scenery at every turn, it wasn't a place we had considered to live. We would see neither a sunrise nor sunset, there would be nothing to do and with more goats than people, we held out little hope for scintillating conversations with neighbours. Hardly a dream come true. But the owners of the finca were very sensible people. They didn't extol the virtues of the sweet little Canarian house already beautifully restored, or the large farmhouse ready and waiting for us to put our imprint on it with our own restoration, or the stone-built bodega perfect for candlelit evenings, or the lovely old stable buildings or two acres of land. No, they just showed us the view. It wasn't too long before we discovered the great benefits of living in the north. Here, we can really enjoy being surrounded by nature and listening to the birds sing without the background of car engine noise. We feel privileged to live among our Palmeran neighbours who treat us as family (and ensure we non-farming types don't expire from a shortage of potatoes!) A lack of something to do has not of course been a problem and luckily we brought some skills with us. David is not only a mechanical engineer but had already restored a country cottage in the UK and a farmhouse in France. As for me, well I was brought up on a poultry farm with a large chicken hatchery and used to work in hotel management .... mmm, that might come in handy somewhere ... We added a few extra touches to the already restored casita (little house) such as hot water and two patios, restored the farmhouse, cultivated the land ... went walking ... went swimming and snorkeling lots and lots at the nearby beach and sea pools and got chickens. And then ducks. In 2010, we walked the whole of the GR130 El Camino Real route around La Palma. And then started to offer walking holidays on La Palma. At the end of 2019, we hope to launch our book, 'Is it Always Like This?' about our travels around the Canary Islands and life here on the finca in Garafia. And, the icing on the cake is that during four months of the year, we have both the sun rise and the sunset. I have to say - it was well worth the wait! Spacious bathroom featuring cast iron Victorian style double bath with shower attachment. There is even a wonderful view from the bath - perfect for a romantic bath for two. Whilst there is a beach 12 mins by car, it's not often suitable for swimming.It's quite narrow but great for beach combing.There are old port building there and a banana plantation. Very interesting! If needs, guests can use our landline phone or mobile. All bed linen is provided - sheets, duvet cover, pillow slips. Two duvets are provided, one thinner, one thicker so there is a choice. Both are synthetic filled so suitable for feather allergies. There is always parking space available at the end of our private drive. Provided, a set each of bath towel, hand towel, flannel. Kitchen towels - hand towels, T-towels, dishcloths and sponge. Beach towels available - please ask before arrival so they can be ready for you. 2 x yoga mats available and 2 x small weights (2k each). We have a wood burning stove in our communal kitchen. Firewood is free, however, we do ask that it is used considerately. To make your stay easier, we provide salt, pepper, oil, vinegar, Fairy washing-up liquid, hand soap, kitchen roll, foil, cling film. Everything is all matching, 6 of each, no odds and ends! Large + small plates, cereal bowls, cups/saucers, mugs, etc. Glasses, 4 of each, matching wine, beer, shot.Cutlery 6 of each, matching. 4-ring gas hob, fridge/freezer, twin sinks, microwave, coffee percolator, kettle, toaster. Although there is no television, we have available a DVD player with large selection of DVD's. It doesn't live in the Casita, so just ask while you are here and we are more than happy to put it in. We have a varied selection of books in English, Spanish, Dutch and German. Plus plenty of guide books and books on learning Spanish. Approx 60 music CDs are available. There are two terraces, plus seating in the ornamental garden. One terrace has chairs and garden trolley/table, the second one has seating and table plus reclining chairs. There is a hard-standing tennis court 500m away which is free to use, but no equipment or net. Please note, there is a fairly steep staircase between the lounge and bedroom/ bathroom. There are also outdoor steps from the car park to the house. If you have any difficulty with mobility and are not sure if La Casita is suitable for you, please ask for more details. Unlimited WiFi. There is a small shop/bar in Franceses, very traditional. However, you might want to stock up at the Spar in Barlovento on the way so that you arrive with at least some groceries. If you are arriving late at night or on a Sunday, there will be some provisions for you. Very quiet place, nice vieuw, central place for al rhe walkings in the northern part of the island. Friendly people, beautiful casita. The place to stay when you visit the nort of la Palma. I'm so glad you had a wonderful time at La Casita and enjoyed the peace and walking so much. It is a special place to take a holiday with such a panoramic view of the sea and the quiet, not so often found these days. And also great that you were able to enjoy breakfast and dinner on the patio every day of your holiday. We look forward to having you return one day! We stayed for 6 days at this beautiful Casita, it was exactly as described, the owners were welcoming and extremely knowledgeable about the whole island, indeed , very helpful about everything one would want and need to know on a self catering break,we had a wonderful stay and wouldnt hesitate to go again, thankyou to Ann and David !! So lovely to hear from you and know how much you enjoyed La Casita! It was certainly our pleasure to help with any suggestions or information about the island. We are glad also that you thought the Casita was just as portrayed - and of course we would love to welcome you back one day. Our very best wishes for happy holidays for the future! Ann and David. We stayed at the Casita for a week towards the end of September, and our experiences matched very closely the great description of the house on the website. Everything was very clean and well maintained, and David and Ann are excellent hosts who can offer you plenty of local advice if you need, while also respecting your privacy when you need that :-) The accommodation is best suited to couples who want to "get away from it all" and enjoy a secluded location and want to do some self-catering. The location at the north of La Palma is best suited for those who want to focus on walking and enjoying the outdoors. It is not very close to the beaches or larger towns, but is convenient for accessing many of the walking trails. Renting a car for your stay is definitely recommended for getting around. We are so pleased that you enjoyed your stay at La Casita. We are always happy to help with information on walking and restaurants etc when asked but respecting the privacy of guests is high on our agenda! Getting away from it all certainly sums it up and for those seeking a little peace and tranquillity, La Casita certainly provides it. Happy holidays for the future and we wish you all the best. This guesthouse is a wonderful place to get away from it all in a beautiful, peaceful location and with stunning views of the coastline. Ann and Dave are highly knowledgable about the island and advised us on all the activities and places to go. We were made to feel extremely welcome from the outset, and they really went out of their way to make our stay particularly enjoybale. The guest house itself is clean, cosy and well decorated with nice touches. A lot of effort has clearly gone into it, There can be no better place to have breakfast than in the garden outside with views over the ocean. All in all, we highly recomend this place to those wanting a peaceful and remote holiday. We're really glad you had such a good stay at La Casita. As you discovered, it's a tranquil place to unwind and get away from it all - and with pretty good views too! And an 'al fresco' breakfast overlooking the Ocean is an excellent way to start the day. If guests are looking for either general information or something more specific such as easy/hard walks, where to go for swimming or diving, the nearby archaeological park, about the Observatories, etc., we are always more than happy to help. Wishing you all the best for future holidays. Jolie maison canarienne ancienne, restaurée avec soin. Située dans un des plus beaux endroits de la Palma, la vue sur la côte est superbe, c'est un des motifs pour venir ici ! Quand la météo le permet, on prend plaisir à profiter dans l'agréable petit jardin du calme absolu de l'endroit. La maison est bien équipée, extrêmement bien entretenue et très propre. Contrairement aux habitudes françaises, les draps et serviettes de toilette sont fournis et les propriétaires ne vous demandent pas de faire le ménage à la fin de votre séjour ... Seul manque peut-être un lave-linge en libre accès pour que ce soit parfait. L'endroit est parfait pour deux, y compris pour une escale romantique. Les bons marcheurs peuvent rayonner quelques jours autour de la maison, des sentiers de randonnée passent à son pied. Un bus passe dans le village pour vous amener dans les villes principales de l'île, mais il est toutefois très souhaitable d'avoir une voiture pour en visiter les autres attraits. De même, si vous restez plusieurs jours, faites vos courses avant d'arriver ! Pour les allergiques à la voiture de location, David assure un service - payant - de transport pour l'aéroport (ou ailleurs). La maison n'est pas adaptée aux personnes à mobilité réduite. En conclusion, une étape de charme parfaite pour un couple aimant la nature. My apologies for not responding in French but I do thank you for taking the time to give a review of La Casita and for writing in French for the benefit of our future guests. It was a real pleasure to have you stay here in Franceses and glad that you enjoyed it. La Casita is certainly a place for nature lovers as the sights and sounds of nature surround you here and yet, with various options for transport such as the frequent bus service, a hired car or Land Rover tours, you are not cut off from the rest of the island. We wish you all the very best for your future holidays, wherever they may be! This was my 4th visit to La Palma in 6 years. I've stayed in some very nice places in different parts of the island but La Casita really takes the honours. Beautifully restored and enhanced by Ann and David. Peaceful and thoroughly relaxing, fabulous views and plenty of excellent and challenging walks starting on the doorstep. My three days passed by too quickly but they were so worthwhile. Definitely another, longer visit next time on La Palma. Fine hosts too, by the way - thanks Ann and David. We are so pleased you found La Casita on the website and that you enjoyed staying here. I think there is a special atmosphere about the casita because it is around 140 years old and must have taken so much effort to build using the local stone and wood, collected by hand. No such thing as ringing up for a delivery! And the restoration was therefore relatively easy and something we loved doing. As you say there are plenty of walks starting with the donkey track just alongside the finca. But for anyone not into walking, the patios are pretty good for relaxing on and admiring the view. We hope to see you back on day! La Palma is famous for walking and la casita is situated just off the GR130 walking route around La Palma. This is the 'Walk of Kings,' an ancient path used by the muleteers which links the hidden villages of the north. Nearby you can discover the wooded paths and tracks, walk down to the sea and beach directly from the door of the casita and also spend a quiet time relaxing on the patios of the casita, drinking in the tranquility, allowing you to relax and unwind. Nearby is the Archaelogical museum where you can see pre-hispanic rock engravings and caves plus walk through the gorge with its little wooden bridges and hanging vines. The large sea pools are also a must do! The water is always super-clear and there are plenty of fish to see. If you are into snorkeller then you have a treat in store, but the pools are also suitable for the less confident swimmer. In summer, you can swim in the open sea where the underwater topography is amazing. If you like cycling, then we have free of charge for guests two mountain/tourer bikes. There is a great 6km circuit which takes in the old village of Franceses with its caves and wooden-roofed dwellings, plus of course you can go further afield if you have the legs for it! The 6km circuit is also great for those that like running/jogging and other paths are ideal for fell-running. Nearby is the Hotel Romantica with its tennis court, covered and open swimming pools, gymnasium and jacuzzi. The price includes: - Free Wifi access Use of 2 x Trek 200 mountain bikes. All towels and bed linen Tea, coffee and biscuits For weekly rents, a fruit bowl and bottle of good quality La Palma wine to help you feel more at home Shorter lets than one week may be available. Discount for stays of longer than one week.